Finished for 2018! See you next season! $3.39/ per lb for less than 20 lbs. Sweet Cherry trees include about 8 different varieties of sweet cherries that all turn a dark red to black when ripe. These rows are planted in succession and flagged as each variety gets ripe. Our employees pick the tops of trees and allow customers to pick the lower portions of trees. Rainier Cherry trees are yellow with a pink cheek. They usually ripen about 10 days after the dark red sweet cherries are ready. These are a sweet cherry as well, but have a different flavor. Tart Cherry trees are all Montmorency variety. They are excellent for pies and freeze very well for baking later. 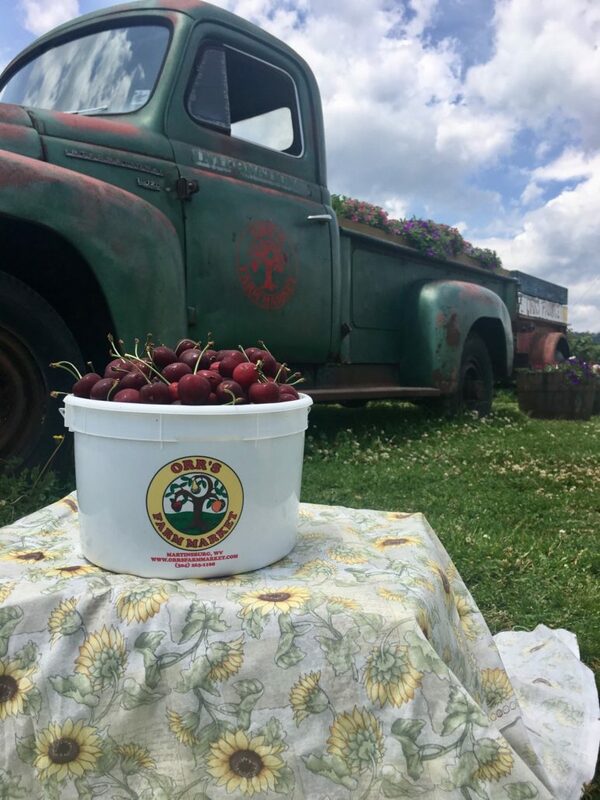 Tart cherries are much more perishable than sweet cherries. It’s highly recommended to pick them with the stems on and use them within 2 days of picking. Our sweet cherries are ripe when the color is a dark reddish black. Pick only the darkest fruit for the sweetest flavor. 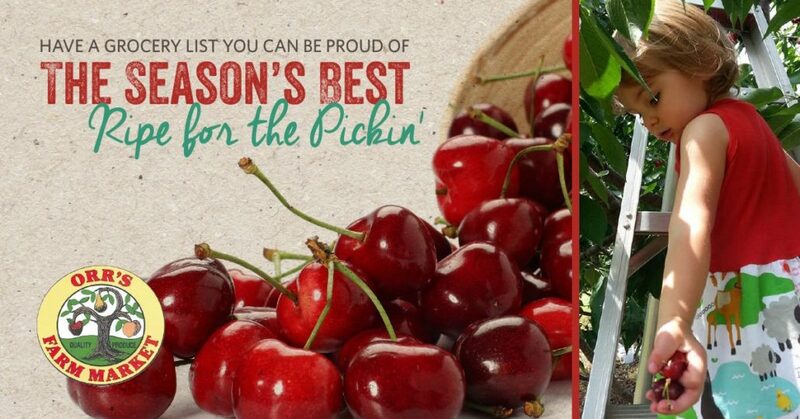 Cherries will not ripen after they have been picked! Tart Cherries turn a bright red and get a softer feel when they are ready. Pick only in the flagged rows! Our cherry trees are planted in succession so that we have varieties to last us several weeks. Not following flagged row picking rules leaves us with overripe fruit, while the customer leaves with underripe fruit. Please help us with this! Do not climb trees for your safety! Cherry tree branches are not very thick and break easily! Pick with stems on to preserve cherries the longest. This is strongly encouraged on the tart cherries because they are very perishable. 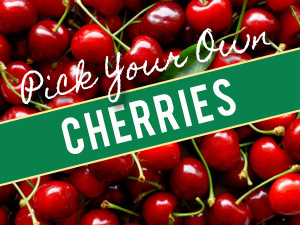 The best cherry picking is usually on the far end of the patch where fewer pickers venture. A little extra walking is usually worth the effort for easy, prime picking. All produce should be washed before eating at home. Please do not consume cherries in the field. Do not overfill your containers to where cherries are falling on the ground. The weight of overfilled containers crushes the cherries at the bottom. A level-filled container is best. You can always get additional containers if needed. Children must be under adult supervision at all times. Tractors in use! Check the weather forecast and dress accordingly. It’s always best to wear sunscreen and staying hydrated with water is also recommended. We work hard to keep Orr’s Farm Market clean and enjoyable. Please do not leave trash in the fields. Wastebaskets are available for your convenience. Restrooms are available. Beverages are available for sale in our Country Store. Patches close for thunderstorms and remain closed 30 minutes after the last audible thunder. Simply wash and drain well on paper towel. Place the cherries in your freezer on a cookie sheet single layered. This can be done with pits or without! After frozen, move the cherries into freezer tight containers or plastic bags and then place back in the freezer for long-term storage. The cherries are good for up to 1 year in the freezer. Great for smoothies!